A magic loop is the start of everything! Knit a tree house? Why not? - rope from Lowe's (not thick or slick). I used four 100-foot packages. To start, you will need loops on your first branch. I "cast on" using the backwards loops method. First, I tied the end around the branch, loosely, and made several knots to secure this loop to the branch. Casting on is basically wrapping the cord around the tree once, then bringing the cord back through the loop you just made. Keep doing that until you have as many stitches as you like. We had 17 stitches. 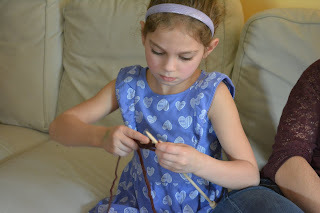 To start knitting, make a loop, then pull it through the first loop on the branch. Put this loop on your left arm. Continue to make loops, taking the cord from the roll, and putting them on your left arm. Here you see the "live" stitches on the left arm of my daughter. To change colors, simply tie on. I leave a long tail and tie several knots in place for extra security. I'm sure you could fuse the cord together with a woodburner but we were too far from the house. Once you have all the stitches on your left arm, then you use your right arm to loop the cord through and turn and go the other way. We divided stitches between my daughter and me and our neighbor and used all six arms to knit. Soon, they tired of this and so I was able to put them on my arm then transfer the stitches to a broom to finish solo. Last summer, I did this in my camp and assigned each person a stitch. This was great teamwork and cooperative play, for we all had to snuggle in very close, wait our turn, laugh and giggle, and help each other keep track of the loop. I hope to chronicle a treehouse knitting like that soon. It really is great fun. After awhile, it was long enough! I then climbed the tree, too the end and tied cord through the loops on the broom, 4-5 at a time, to secure the end to the next branch. It wasn't rocket science, just tying it on tight enough and repeating it enough to be secure. And now time to use the treehouse! Davis tried not to smile and insisted on not smiling. But he sure did spend a lot of happy time in his new treehouse! The treehouse is a place my kids go to often when they want to be alone, and also when they want to be social and climb a tree. They read books there, use it to climb higher, and sometimes just hang in peace. It's movable and versatile. There they are, knitting needles and yarn, materials that bear within their design a whole history of humanity. Who thought to create smooth sticks so that a choreography of yarn could be developed that produced items for survival? Who thought to twist plant or animal fibers into yarn and rope? But today, although that history might be long past, the hands seek to move, to make, to connect. Perhaps in our digital world, it is even more important to consider the gifts of knitting and of using our hands. We live in a world that limits our human impulses for motion, movement, and invention. We live in brains that respond accordingly. Looking at the triune brain model, we can see how knitting helps develop key areas of our humanity that might be missing in modern life. Our reptilian brain processes are responsible for those things that keep us alive: breathing and our heart beating regularly. The name of the game is survival. Picking up a pair of knitting needles relaxes you. There are no threats. Your breathing and heart rate soften and regulate. You are making perhaps a hat or a sweater to wear, to clothe your body, to care for yourself or someone else. This is survival at its most basic level. Knitting is a rhythmic activity that mirrors the rhythm of body processes. The limbic system is called to action by stress of some kind. This puts your system into fight, flight, or freeze. In a knee-jerk evaluation of danger, it expresses high emotion or immediate reaction to danger. If there has been trauma in the past, the limbic system will regard situations as dangerous that are not dangerous. These are called trauma triggers. The limbic system houses our feelings of stress, fear, emotional pain, and anxiety. Because the limbic system is so quick to respond and heightened, it can be used to great advantage. Anxiety in a person who's experienced trauma is an awakening. In the midst of the emotional response, a quick thinking also arises that uses intuition to solve problems. Knitting inherently educates the limbic system because it is not dangerous, but it will cause stress. Learning a new stitch or following a pattern causes feelings of frustration, fear of not being able to "get" it, anger at yourself or the project. It might cause you to throw down your needles and tangle your yarn. It is the basis of what is known among knitters as "frogging", which is where you take out a project in which you may have invested scores of hours. The limbic system holds the details of the project and reacts when things don't go your way. Outside of fight-or-flight, our emotions also guide us to activities that are pleasurable. We work through a knitting problem because knitting FEELS good. It feels good to settle into a project, to soothe ourselves, and to produce something creative. It feels good to give to people out of the love of our hearts, and to create our own style through knitting projects. To use knitting to train your Limbic system, knit a February Baby Sweater by Elizabeth Zimmerman. Read all of her books, too. Your emotions will be completely regulated by the time you wave through that satisfying feather-and-fan pattern and read her engaging and humorous stories. The neocortex holds the processes we thing of as higher: memory, invention, imagination, abstract thought. Part of the neocortex is the prefrontal cortex. This is the part of your brain that is deliberate and slow in its processing. It is like the wise old man that carefully considers all pieces of a problem before deciding on a course of action. This is the part of the brain that is most nourished by knitting. Knitting requires you to hold in mind a goal; let's say, a sweater. There is a whole picture of a sweater you must continually imagine...calling on memory, limbic regulation, and abstract thought to hold on to that image. Then, stitch by deliberate stitch, you construct your sweater, bringing to life your image. This is the heart of creativity and invention, and flexing that muscle allows you to have the capacity to create new models elsewhere. It allows you to accept the teaching of others as well, for if your survival is taken care of, and your emotional state is not reacting to environmental threats, you are able to learn. Human development through the ages has rested on this ability to create and accept new models. From survival to emotional regulation to the advancement of humanity, knitting has it all. For prefrontal cortex stitching, knit intarsia or better yet, lace. There is a complete trust one enters into when complicated imagining is called upon. If a mistake is made, you can correct it by taking it out and starting again. Patience and perseverance are required, for as each row varies, it starts to make sense as part of a beautiful whole. One of the things I often heard when becoming a knitting teacher was the importance of knitting in developing cognitive skills. This rested on knitting's reinforcement of "crossing the midline." What is this "crossing the midline" business and why is it so important? First of all, the midline is an imaginary vertical line drawn straight through the middle of the body, separating right from left sides of the body. The ability to cross the midline in our bodies is important for physical things like going up stairs, riding a bike, crawling, going up a ladder, etc. It is also important for intellectual things like reading, writing, executive functions such as decision making and organizational skills, and our sense of language. Basically, crossing the midline is about integration. It is the ability to use both "sides" of your brain at once. There are lots of everyday activities that require you to cross the midline, such as tying shoes and reading. The goal of crossing the midline is "lateralization" which, simplified, means both hemispheres of the brain are communicating and hand dominance is established. "Furthermore, when a child has difficulty crossing midline, it can affect his/her ability to read. While the child is moving his/her eyes from left to right across the page, the eyes will stop at midline to blink and refocus; however, when this happens, the child will very frequently lose his/her place on the line and become confused as to where they left off. It also affects handwriting, as diagonal lines cross the midline, and the child may need to stop in the middle of the page to switch hands when writing from left to right. Many self care and daily living skills require crossing midline. For example, perfecting the skill of putting socks or shoes on requires one hand to cross over to the other side of the body. Children who have difficulty crossing midline may appear ambidextrous because they are often observed using both hands, but they actually have a hidden neuroprocessing issue. Both sides of their brains are not communicating, resulting in decreased coordination, decreased motor control of movements and difficulties achieving higher level skills. Often, these children end up with two unskilled hands." Knitting completely reinforces this ability. Both hands are used, and one hand comes to dominance. After knitting, hand dominance can be strengthened through crochet, which more heavily emphasizes a dominant hand than knitting. There are different ways to learn how to knit, but I start out teaching my students to "throw" the yarn around the knitting needle. Think about stirring a pot. If you stir a pot of soup using your right hand, you will cross the midline as you stir it around towards your left hand and back. Your left hand might have to steady the pot. For this reason, knitting is absolutely an activity that crosses the midline and helps establish lateralization. "Throwing" the yarn around the knitting needle, switching the work from hand to hand in a rhythmic, repetitive gesture requires crossing the midline in an activity that also develops fine motor skills. And it's fun, and it's artistic. So the next time you think knitting is just a hobby, think again. It's a way to develop capacities needed for reading, writing, thinking, organizing, catching a ball, riding a bike, etc. etc. It's just plain healthy! These are some of the projects that you can not only teach to your children, but that your children can knit themselves. My journey of teaching handwork began with a fascination with knitting. I could not explain the draw I had to knitting. My children and I were taught to knit by a woman from the Ukraine, Maria, who could not speak English. That year, I was working as a seamstress in a bridal shop with Maria. We spent an evening at her home with her entire family, and I remember her warm hands, her smiling eyes, her easy laughter, and the way she gently guided our hands as we learned to knit. While we enjoyed our evening, my confidence to knit waned a bit and I did not take it up as a practice right then. Through these past twenty years of devotion to the practice of the hand arts, I have learned how very important it is to work with our hands, to have something that was lost along the way. There is a spirit behind everything we do. In our world today, we often forget that spirit as we keep our minds focused on the next thing, on achieving the goals and outcomes we have set for us in our jobs and personal lives. This creates a rushed feeling of disconnection, and this disconnected feeling is actually important to help us cope with the pressures of modern life. But it does not have to take us from who we are, and as human beings we are meant to be connected. 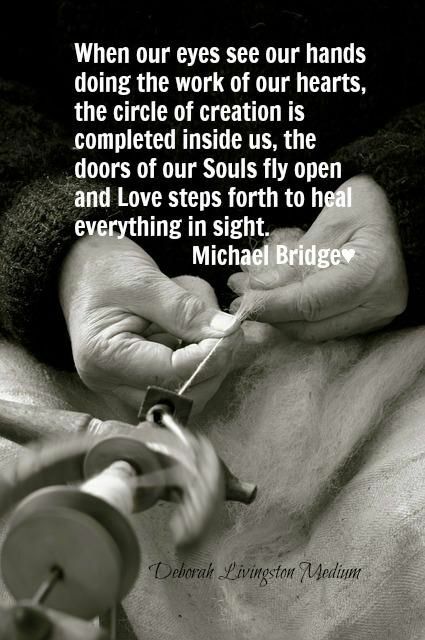 This spirit of connectedness, of finding the spirit of life, can be found in the practice of handwork. Any child who works with their hands learns something of themselves and the world. Often, we highlight the benefits of knitting and the hand arts in relationship to how they reinforce concepts in numeracy, capacities that build literacy, and encourage rhythmic self-regulation. These are all wonderful aspects of how handwork can enhance a child’s education. Deeper than that are the gifts of spirit and connection with others. Children are learning the art of practice, and are practicing capacities of soul that help shape them as compassionate human beings in the world. Holding materials in your hands that are from nature awakens one’s thoughts of the natural world. We connect with these materials that come from the earth, and in entering the creative process, we learn to have a dialogue of sorts with these materials, through using our hands to transform them. In rubbing wood on stones to shape a knitting needle, we are taking the gifts of the natural world and transforming them into something useful for ourselves or others. In feeling the sheep’s wool, or the cotton boll, we are touching the gifts of the earth. When we are exposed to these things, aware of them, we feel ourselves as part of a whole. We feel that the world provides us with so many good things. We feel cared for. This whole includes other human beings, with the same needs and wishes as ourselves. Practicing the hand arts means you will most certainly bump into yourself. You will get angry, frustrated, and struggle mightily. I remember one boy who taught me much about grace. As a teacher, I have to discern when to step in and assist and when to simply allow the learning process. One boy was in tears over his handwork as he struggled repeatedly with something. I offered to help move him to the next level and he said “No, I need to figure this out.” And he did figure it out. This is the learning of grace-that our struggles have meaning, and we can work through them out of our own capacities. We can trust ourselves. We also have plenty of helpers in the form of teachers and fellow students to support us in moving through any struggle. Mistakes are a frequent part of any hand arts practice. Soon, you realize that your materials are forgiving, perhaps more forgiving than you are of yourself. It you make a knitting mistake you can’t fix using any of those clever teacher tricks, you can rip it out and the worse]t thing that can happen is that you have to knit or stitch it again. Second chances are in grand supply. Sometimes a piece cannot be salvaged. This, too, is forgiveness, for when you let go of something that bears disorganization, holes, or is too representative of failure, it is a good thing. Learning when something can be transformed is important. Most of the time, forgiveness is found in being flexible enough to make a “failed” project into something else. This letting go and flexibility encourages creativity and a curiosity of spirit. How can we transform things that don’t fit into our original vision? Oh, we must forgive everything and try again. Practicing this capacity deepens invention and improvisation. The art of practice is something that doesn’t quite fit into our busy day and age. Yet in practicing something repetitive, that both soothes and awakens our feeling life in so many ways, we are building ourselves. We learn how to breathe in and breathe out. We learn how to try and try again until we have made it even more beautiful. We gain a sense of beauty and how we bring ourselves to beauty. In practicing something, one also gains a sense of the time it takes to gain mastery and accomplishment. Most things in handwork take a long time to make. This, too, is outside of what our culture-at-large values. We often want things that are instant, or that save us time. Many people say to me, “Oh, I don’t have the patience for knitting.” It is foreign to some to think that taking a long time to practice and accomplish something is valuable. Think about what practicing something teaches us: that we can handle it. That we can take on things that seem impossible to US. That we are capable and able. That we can work through confusion and feelings of being overwhelmed. We learn how to be present to what we are doing by accepting the magnitude of the task. In craft circles, people celebrate each other’s accomplishments. In the classes I teach, children will sing a song to a fellow student who has finished their project. After all, it IS such the accomplishment. In class, students learn how to deal with their struggles and also the struggles of others. When I was working in the bridal shop, my manager said something to me I will never forget. She said, “You need to ask more questions. No one should have to sit in a corner struggling alone.” I took that to heart. In handwork class, no one struggles alone unless they really need to. There are always friendly and supportive helpers. Knowledge of skill is shared freely. Learning to trust, help, support, and affirm each other creates a positive social atmosphere. It pulls us out of egocentricity and into experiencing ourselves as part of a whole. From there, we recognize that we have something to offer to the other. The work of our hands is important for many reasons that teach us how to be a human being, and how to connect with nature, each other, and the spirit that underlies all things. Besides a feeling for beauty, the development of a strong will, and a sense of artistry, handwork brings us into the flow of life. It is through our hands that we touch something of ourselves and each other, and the creative spirit that imbues all life.